CUI’s Power Group has added 275W, 350W, and 550W models to its VOF family of open frame ac-dc power supplies. 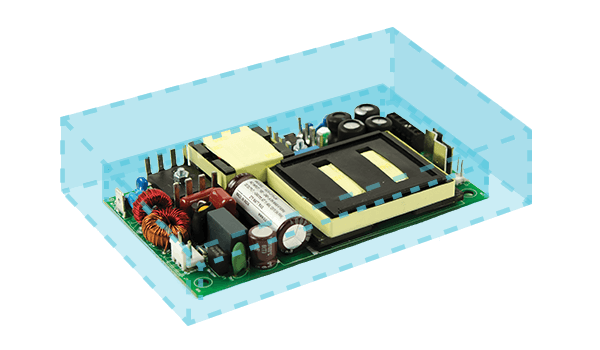 The VOF-275, VOF-350, and VOF-550 series are housed in compact, low profile packages measuring 76 x 127 x 19mm (3 x 5 x 0.75in) with high power densities up to 24.4W/in3. Coupled with high efficiencies up to 94% and no-load power draw as low as 0.5W, these open frame ac-dc power supplies are aimed at IT equipment, industrial, and telecom applications where space and energy consumption are of major concern. The three new VOF series offer output voltage options from 12 to 58Vdc and feature wide universal input voltage ranges up to 80 to 264 Vac. Certified to the UL and EN 60950-1 safety standards, the power supplies further meet EN 55032 B requirements for conducted and radiated emissions. All models also provide power factor correction, a 12Vdc/500 mA fan output, and protections for overvoltage, overcurrent, and short circuit. Operating temperatures range at full load from -40 up to +50°C with forced air cooling, derating to 50% load at +70°C. The high density ac-dc power supplies also carry an MTBF of 3.37 million hours, calculated to Telcordia SR-332 Issue 3 specifications.